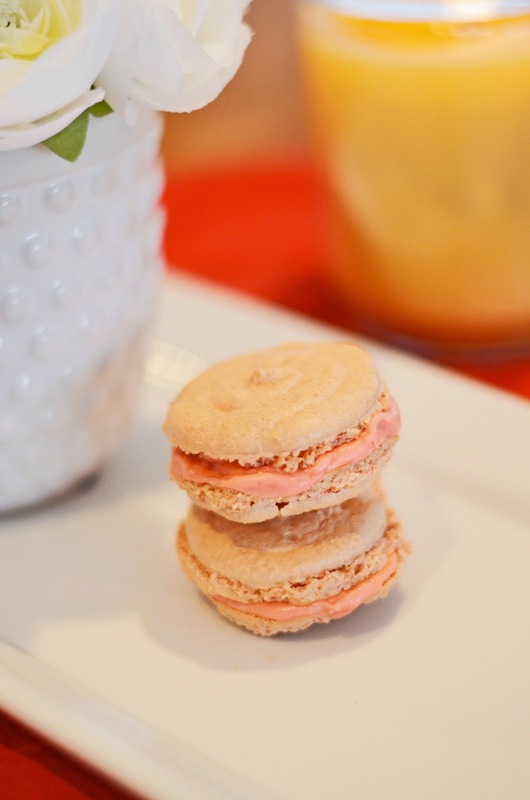 What says Valentine's Day like a few lovely, pink macaroons? 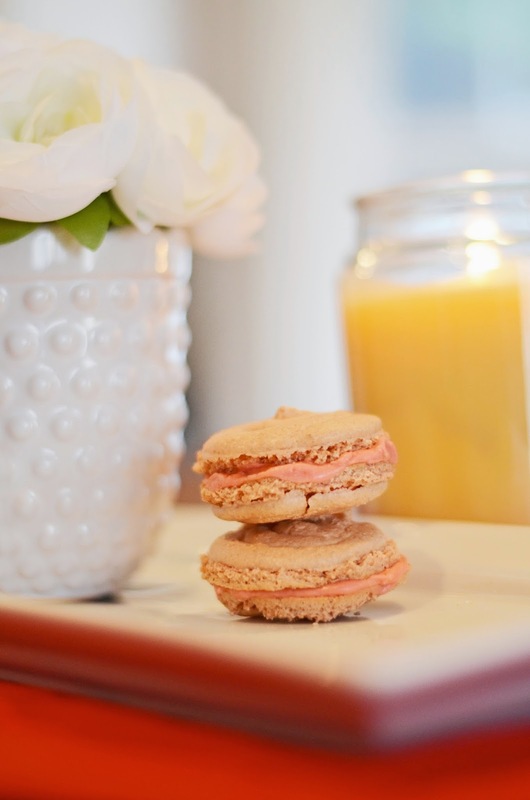 I've never in my life had a macaroon, but I know they are stinking adorable and I've always wanted to try one. Since I can never find them around here I decided to attempt making my own. And what better occasion than V-day? Ambitious right? Now I know these don't look perfect, but it was my first attempt so I gave myself some grace. I will admit, they weren't easy to make. There is obviously a real art to making them, but they did taste sweet and fluffy with a slight crunch. Like a sweet little pillow in my mouth! Plus I made the butter-cream center from scratch and basically devoured the entire bowl so that was a plus. Now maybe if I just work on my technique in the texture I could have a near perfect macaroon one day? 1/3 cup flour (you should use almond flour, I used wheat flour. While I think they tasted delicious, it may have taken away from the texture). • Preheat oven to 350F. Whisk your flour and powdered sugar together. • In a seperate bowl mix your egg whites and sugar on medium-high for about 8 or 9 minutes. You • can add your food coloring here if you so choose. • Next turn the mixer to high for 5 minutes. • Dump in the flour/sugar mixture and use a spatula to fold and combine this mixture. It will take a couple of minutes to completely combine the mixtures, but your end product should be somewhat dry and slide slowly off your spatula. • Now lay a piece of parchment paper on a baking sheet and use the base of a 1" cup to draw out circles on your paper with a marker. I used the base of a condiment cup. This will help you make even sized portions. • Fill a pastry bag (or ziploc bag with the corner cut off) with your batter and gently pipe out 16 cookies in a circular motion. • Bang the cookie sheet on the counter twice to settle your cookies and get the air bubbles out. • Bake them for 15 minutes watching them closely. Remove them when finished and let them sit for 30 second to a minute before moving to a cooling rack. • Once they are completely cooled you can spread your buttercream, jam, frosting, etc and make them look pretty! • Mix your powdered sugar and butter on low for a minute. • Add your vanilla and gradually add your milk (not all at once) watching for your consistency. It should be just smooth enough to spread. not too thick, not too runny. 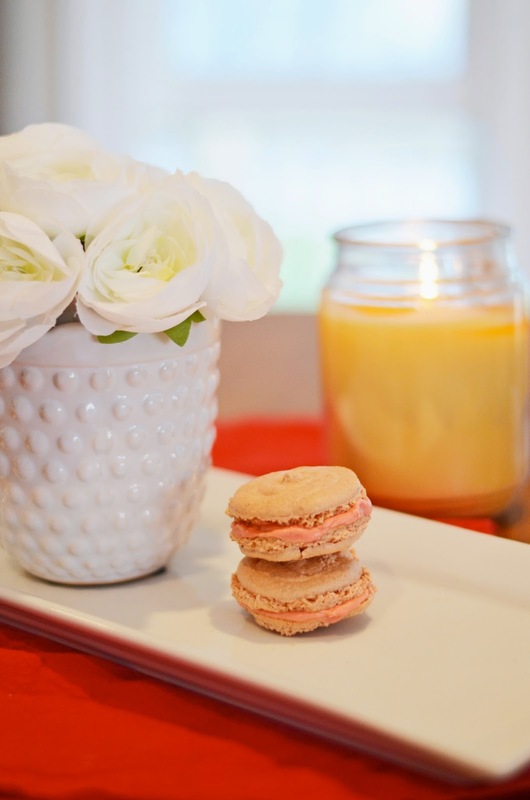 10 comments on "Bon Appetite || Macaroons"
Woo they look just like the ones I had in Paris! :) Great job!! I've never tried making my own macaroons but I want to now! These look and sound amazing!!! hmmm, I have all of the ingredients! They look great! The almond flour makes them super light and fluffy and makes them rise into that signature dome, regular flour is a bit too heavy (or at least that's what I've been told!) Try it again with the almond flour and see how it goes! These look great though! I'd eat em! AH! I've been wondering about macaroons! Thanks for the recipe. Girl, you are brave for attempting these on your own. I've always wanted to but am so darn intimidated. I think they turned out great! Definitely saving this recipe for later. Have a good weekend! I've never had one either and always wondered if they were good. They sure do look good! Happy Valentine's! Hi, My wife and I have been married for 15 years. For over five years I have been dealing with jealousy issues because of flirting and her having emotional type affairs with other men. I felt like my masculinity was in question and if I said the way she was acting bothered me, it seemed to make matters worse or I was accused of being controling. During this period I did state I wanted a divorce if the behavior was not going to end: texting men a night, leaving for the weekend without letting me know where she was going or not responding to messages. We do have a son and basically it's been him and I for the last year on the weekends. She disconnected completely from being a good wife and mother. In April she said she wanted a separation and I said no we need to get into marriage counseling. We did try that, but she was not very responsive and didn't give any effort. Afterward she was adamant about separation and divorce. I continued to say no and that we needed to save our family. She presented a separation agreement and I had to hire a lawyer. Because of the above behavior my lawyer suggested a private investigator. The investigator discovered my wife was having an affair with a close friend of the family who also is married with children. We know the extended families. I feel like I should tell this man's wife about what happened. This adultery has devastated me emotionally, I feel betrayed and I'm physically drained. I know my wife is passionate in terms of her sexuality, and I can't get the thought of them out of my head. It makes me question my own manhood, and I feel very inferior or that he must be a better lover or what ever. The problem is my wife pursued him. She would go to him and she lured him into this adultery. I felt this was coming for some time and could not stop it. She was not only lying to me but also to our son about what she was doing and where she was going. My family is important, my son loves her and as crazy as it sounds so do I. Can you respond with a course of action on how to proceed? I was still have a very huge place in my heart for her. so i searched for help online and I came across a website that suggested that Dr Ahmed can help solve marital problems, restore broken relationships and so on. So I felt I should give him a try. I contacted him and he told me what to do and i did it then he did a spell for me. 28 hours later, my wife came to me and apologized for the wrongs she did and promise never to do it again. Ever since then, everything has returned back to normal. I, my son and my wife are living together happily again.. All thanks to Dr Ahmed. as it is a place to resolve marriage/relationship issues, do you want to be sure if your spouse is being faithful to you or Do you want your Ex to come back to you Contact. : E-mail: Ahmedutimate@gmail.com or call/Whats-app: +2348160153829 save your crumbling home and change of grades its 100% safe. I suggest you contact him. He will not disappoint you.